Chapter 4 in The Great Potential of Bangalore’s Waterways. Full study available here. By Henrik Valeur and co-authors Radha Chanchani, Jaya Dhindaw and Kadambari Badami, Center for Infrastructure, Sustainable Transportation and Urban Planning, the Indian Institute of Science, 2012, and Harman Preet and Sameera Sneha, the Indian Institute of Technology Roorkee, 2013. Bangalore is said to have evolved around a system of interconnected water-bodies; this system was presumably developed in response to the lack of any major surface water source, such as a nearby river with continuous water-flow throughout the year. Water-bodies would form naturally in the undulating landscape of this region and only minimal human effort was needed to turn these water-bodies into “tanks” for the collection and storage of rainwater that could be used for multiple purposes, including the irrigation of agricultural land. It has been assumed that the first people settled around these water-bodies and that the region of Bangalore therefore consisted, initially, of many smaller settlements located at different altitudes, with wetlands providing connections through which water could be distributed from one settlement to another. The high level of interdependency between these settlements, in terms of both food and water, would have been further strengthened through intermarriages and through various forms of social interaction. Such a landscape could be referred to as a “continuous social landscape”,(3) in contrast to the discontinuous and anti-social modern landscape typified by gated communities and expressways. The self-organized system of interdependent settlements was replaced with central control in the 16th century, when Magadi Kempegowda is believed to have founded the city of Bangalore. With the rule of the Kempegowdas and later the Wodeyars of the Mysore kingdom, the natural/partially man-made network of water-bodies and waterways was extended through the digging of wells and channels for purposes of increasing water availability and for purposes of bringing larger land areas under cultivation. Thus, the landscape of Bangalore was dotted both by naturally formed ponds and lakes and by man-made tanks or reservoirs, which were connected by streams, wetlands and man-made canals that are called nullahs (in Hindi). During the British reign, streams and wetlands were put into canals in order to increase distribution efficiency and to provide land for urban development. The network of water-bodies and waterways helped to effectively drain the city region and functioned as an extensive “rainwater harvesting system” while also playing an essential role in the recharging of groundwater and in ensuring a high water table in the region. The “tanks” were the main sources of water for drinking, domestic and irrigation purposes, supporting a rich assortment of farmlands, orchards, nurseries, urban parks, gardens and trees. Tanks and canals had a beneficial effect on the microclimate of the region by preserving ambient temperatures and by making the city naturally “air-conditioned”, with open spaces and picturesque settings that also brought flora and fauna into the city. By contributing to its pleasant climate and supporting its omnipresent greenery, water played a crucial role in the construction of Bangalore’s identity (self-image) as “City Beautiful” and “Garden City”. As the expanding city swallowed up more and more agricultural land, the need for irrigation water was reduced and with the arrival of piped water supply, following the creation of the Hessarghatta (1894) and later the Tippagondanahalli (1933) reservoirs on the Arkavati River, a tributary to the Cauvery River, the network of tanks and canals gradually lost its relevance. Around 1940, a comprehensive underground water supply and drainage scheme for the entire city was put into action. As a consequence of this, many of the open canals began to be used as wastewater and sewage drains and some of the tanks were drained and put to other uses. The situation has since worsened dramatically in synch with the rapid industrialization and unplanned urbanization of the post-Independence era. With water being sourced directly, since 1974, from the Cauvery River,(5) the network of waterways and water-bodies lost any relevance as a source of water as well as its earlier religious, socio-cultural and occupational importance, leading to its steady deterioration and neglect. The waterways have been narrowed, encroached or completely blocked up and built upon, leading to a loss of drainage connectivity between the water-bodies. Instead, the water channels, which were meant to carry storm water, have been turned into dumps for sewage, wastewater and garbage, which flow directly into both lakes and tanks, contaminating and choking them, destroying aquatic ecosystems and turning them into breeding grounds for mosquitoes. Lake- and tank-beds have also been used as dumping grounds for garbage, construction debris and have been encroached upon by unauthorized cultivation, constructions or settlements – destroying the soil and peripheral vegetation. This, in turn, has led to erosion and silting, reducing the lakes’ and tanks’ water-storing capacity until they eventually dry up. Draining and breaching the waterways and water-bodies have been proposed by the city’s municipal authorities with an eye toward “creating” land for the development of new roads, residential layouts and other purposes – often in violation of existing legislation. In this same period, the population of Bangalore has grown exponentially: from 1,654,000 in 1971 to 8,425,970 in 2011. 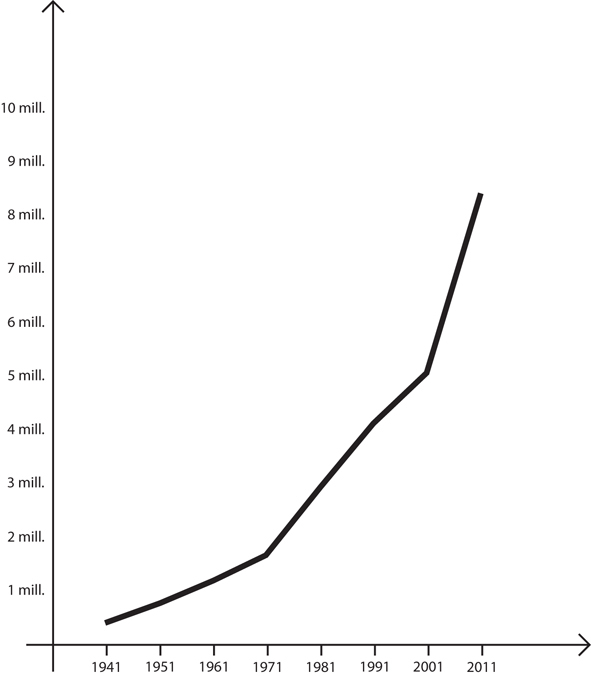 Population growth in Bangalore since 1941. Source: Bangalore; Wikipedia: https://en.wikipedia.org/wiki/Bangalore (accessed July 15, 2013). The land area of Bangalore has correspondingly increased, with the built-up area now covering at least twice as much land as it did only a decade ago. 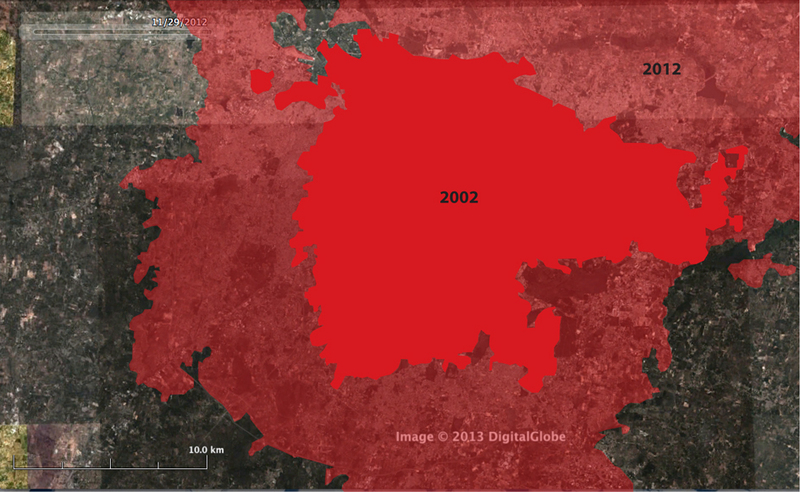 The urbanized area of Bangalore in 2002 and 2012. Source: Google Earth (March 10, 2002 and November 29, 2012). As a result of the aforementioned developments, Bangalore is now facing a major water crisis, with the per capita water demand in the city being 150-200 liters per day while the actual per capita supply available is only 100-125 liters per day. (8) The demand for water has resulted in the rampant sinking of bore wells, which have depleted the groundwater table (which is now more than 1,000 feet below the surface in many parts of the city). The shrinkage and pollution of water bodies has resulted in the loss of alternate sources of water and in a decline in the recharging capacity of groundwater, in mosquito menace and in other health hazards, in the destruction of aquatic ecosystems and the loss of biodiversity and wildlife, in frequent flooding, in changes in micro-climate and in rising temperatures, which are further exacerbated by the reduction in vegetation and the loss of natural open/green spaces in the city. Finally, it has caused the loss of livelihood opportunities for many traditional users, including farmers, cattle herders, fishermen and dhobi (people who make a living doing other people’s laundry). Of particular concern are the untreated wastewater, the sewage and the solid waste that flows through the waterways into the water-bodies, which contaminate not only the surface water of these water-bodies but also the groundwater. With more than two million motor vehicles having been added to the streets of Bangalore during the past decade, increasing from 1.6 million in 2001 to 3.8 million in 2011,(9) the city is also facing a major mobility crisis in terms of severely increased traffic congestion,(10) another consequence of which is that space for traditional small-scale economic activities and social interaction in the streets has vanished. Motorized transportation may also have adverse effects on human health, on the environment and on development opportunities. The negative human health effects related to motorized transportation in cities range from sudden death to shorter life expectancy, reduced fertility, cognitive decline, chronic suffering and poorer quality of life. The causes include accidents, air pollution, noise, stress and physical inactivity. The lack of green spaces for recreation and social interaction may have further detrimental effects on human health. One possible solution to the water crisis, the mobility crisis and the health crisis may be seated in the revitalization of Bangalore’s unique network of water-bodies and waterways. It has been found that while the city of Bangalore is turning its back on its waterways, which have become unhygienic “backyard” spaces of the city or are being put underground, the neglected waterways in many other cities around the world are now being restored – in order to improve both the ecological balance of the city and the quality of its citizens’ lives. Submerging Bangalore’s waterways underground may indeed solve certain immediate and pressing problems, like the dumping of garbage and sewage but it may also impede solutions to other more serious problems – and it may prove to be irreversible. There is a good reason to stop and think about all of this! 1 Quoted from: Silent Spring; Rachel Carson; 1962. 2 In low-lying areas, the soil would be richer – and the crops grown here would require more water. 3 Quoted from: Interdependence Between Man and Environment in Making the Region of Bangalore; Ashwin Karjatkar; 2007. 4 The three valleys are Hebbal Valley, Vrishabavathi Valley and Kormangala Challaghatta Valley. 5 Today, the Cauvery River, located about 135 kilometers from the city, provides 80 percent of Bangalore’s water, according to information obtained at the Sri. M. Visvesvaraya Rain Water Harvesting Theme Park; 2012. 6 Source: Wetlands of Greater Bangalore, India: Automatic Delineation through Pattern Classifiers; T.V. Ramachandra and Uttam Kumar; 2008. 7 Source: Conservation and Management of Wetlands: Requisite Strategies; T. V. Ramachandra; 2012. 8 According to information obtained at the Sri. M. Visvesvaraya Rain Water Harvesting Theme Park; 2012. 9 Source: Road Transportation Year Book (2009-10 & 2010-11); Ministry of Road Transport & Highways, Government of India; 2012. 11 Source: Policy Paper for Pedestrian Movement in the Bangalore Metropolitan Region; Directorate of Urban Land Transport, Bangalore; 2008. 12 Delhi: 21% walking and 12% cycling; Shanghai: 27% walking and 20% cycling; Tokyo: 23% walking and 14% cycling; Munich: 28% walking and 17% cycling. Source: Model share; Wikipedia: https://en.wikipedia.org/wiki/Modal_share (accessed July 15, 2013).